Remarks: The Skolt and the Inari Saami editions were published in 2000 for a number of 500 speakers each. 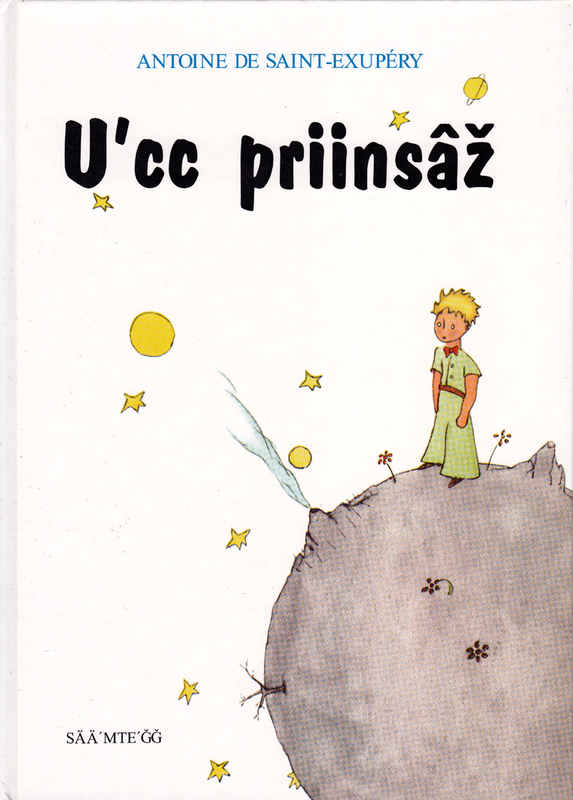 As far as I know these languages are the smallest having a translation of the Little Prince. Vuõi, muu u´cc priinsâž! Mättjam fi´ttjed simmnai simmnai tuu u´cc lo´sses jie´llmad. Kuu´ǩǩ ääi´j se´st jiâ tu´st leäm leämmaž jee´rab hää´sǩesvuõđ ǥu mooččâs jeä´ǩǩesvei´ǧǧ. Tän ođđ ää´šš ku´llem tu´st neelljad peei´v tue´lää. Te´l ton sarnnuk mu´nne: Rä´ǩǩstam jeä´ǩǩesvei´jjid. The Saami language is nowadays spoken by around 35,000 - 40,000 people and divided into 10 dialects. The main distinction is made between Eastern, Northern and Southern Saami dialects; Skolt Saami belongs to the "Eastern group" and is spoken by about 500 people between Inari and the Russian border - see also: Ethnologue Database and The Sámi Languages.